Hazel Joan Schatz, better known as "Grandma Hazel" to her grandkids and many of their friends, passed away in her home on April 8th, 2017. She was 92 years old. Hazel was born March 19, 1925 in Milfay, Oklahoma, to parents Walter and Willie Orr. She married George H. "Bud" Schatz in 1945. They built their Tonkawa home in 1950 where they raised five children and where Hazel continued to live independently until her death. She retired in 1990 from a long career with Conoco Phillips Oil Company. At the age of 89, she completed RCIA and became a proud member of the Roman Catholic faith. She was preceded in death by her husband, parents, brother Lee Orr, and her beloved step-father, Charlie Jones. She is survived by four daughters and much loved son-in-laws: Carol Looper and husband, Fred, of Ponca City; Anita Webb and husband, Alan, of Edmond; Cindy Burks and husband, Dwayne, of Sand Springs; Patricia Ross and husband, Terry, of Tonkawa; and one son Mark Schatz and Doris DeBuhr of Ponca City. She is also survived by 10 grandchildren, 15 great-grandchildren, and a great-great-grandchild due in August. 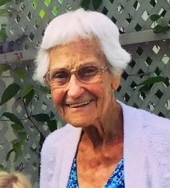 The family would like to thank Hazel's home health angel, Karin Horinek, and the many caring nurses, the staff from Blackwell Hospital, HealthBack Home Health Care, and Humanity Hospice, as well as Meals On Wheels and many neighbors and friends who helped watch over our mom in her final years. Special thanks to Helen Caughlin for faithfully delivering Holy Communion the last few months to her at home. A Mass of Christian Burial honoring her faith will be held at 2 p.m Wednesday, April 12, 2017 at St. Joseph Catholic Church in Tonkawa. In lieu of flowers, the family knows that Hazel would much prefer a donation to The Opportunity Center, 2225 N Union, Ponca City, OK 74601, which is an organization that provides services for her oldest grandchild, Sonya. The Center provides life-long benefits for people with developmental disabilities in Kay County. For more information, visit opcenterok.org. Service arrangements will be made by Trout Funeral Home of Tonkawa. To send flowers or a remembrance gift to the family of Hazel Joan Schatz, please visit our Tribute Store. "Email Address" would like to share the life celebration of Hazel Joan Schatz. Click on the "link" to go to share a favorite memory or leave a condolence message for the family.